A chemical peel involves the use of an acid solution to remove scarred or damaged outer skin layers. It is mainly used as a facial peel. Typical solutions applied are Glycolic (alpha hydroxyl) acid and TCA (trichloroacetic acid). Contrary to what many people think chemical peeling is a less invasive method and one of the oldest cosmetic treatments in the world. It is highly effective in eliminating facial wrinkles, blemishes, skin pigmentation and exfoliating dead skin. A glycolic peel is a fine solution for achieving full facial rejuvenation. You can contact Metamorphosis for further clarification on any issue you have regarding the treatment including the following. Are there any side effects, risks or specific precautions to be taken before the treatment? In order to enhance damaged skin appearance, a chemical solution will be applied on the skin. This will cause a slight burning sensation and you will notice formations of ‘blister’ like appearances on the skin. These will soon peel-off. The newly formed skin layer will look noticeably smoother, healthier and clear of wrinkles. It is important to remember the new skin takes the time to acclimate to environmental elements. If you have fair skin direct exposure to the sun, harsh soaps or cosmetics should be avoided. Patients are advised to use an appropriate (broad spectrum) sunscreen to protect against skin damage from sun’s ultraviolet light. For best results of chemical peeling, proper aftercare is essential. The recovery period after treatment may vary according to skin condition and depth of the procedure. A medium depth chemical peeling skin treatment can be repeated within 6 to twelve months. AM I A CANDIDATE FOR A CHEMICAL PEEL PROCEDURE? Chemical peels are very safe procedures with fairly predictable outcomes. They are suitable for any skin type including Asian, Black, Caucasian, or Mediterranean. However it is always best to seek a proper consultation and choose a procedure that is likely to work best for the current condition of your skin, and health history. WHO SHOULD NOT TAKE CHEMICAL PEEL TREATMENT? You should not seek chemical peel treatment if you are pregnant, are suffering from cold sores, are allergic to aspirin or salicylates, have dormant eczema, or are using Retin-A or Accutane. WHAT SHOULD I EXPECT FROM A CHEMICAL PEEL CONSULTATION AT METAMORPHOSIS? A personal consultation is the first step for everyone considering a chemical peel treatment. 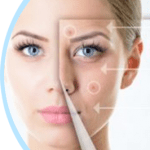 During this consultation, your skin specialist will evaluate your skin type; discuss your specific cosmetic goals, and assess the health of your skin. This would include checking the severity of any sun damage, uneven pigmentation and surface imperfections.